Phil Mickelson of the United States celebrates a birdie on the 14th green during the first round on day one of the 145th Open Championship at Royal Troon on July 14, 2016 in Troon, Scotland. TROON, Scotland -- History was on the line in the opening round of the 145th Open Championship at Royal Troon. And then it lipped out. Phil Mickelson came thisclose to draining a birdie putt on the 18th green for a 62, which would have been the lowest round ever recorded in major championship history. He settled instead for a 63, becoming the 26th player to go that low on so grand a stage. After luckily skirting the pot bunkers left of the fairway with his drive on 18, Mickelson knocked his approach onto the center of the putting surface, 18 feet right of the hole. While walking up the fairway on a flawless day on the rumpled linksland, Ernie Els, one of Mickelson’s playing partners, offered encouragement. “Come on buddy, you gotta make this putt for a 62. A lot of guys have tried,” Els said. “Absolutely,” Mickelson said. MORFIT: Phil Proves Golf Provides the Best, and Worst, of Times On the green, Lee Westwood, the third member of the group, two-putted and stepped away. Els was inside Mickelson’s ball but volunteered to putt first to clear the stage for another Phil-the-Thrill moment in the making. Mickelson struck the right-to-lefter precisely as he intended. As the ball tracked toward the hole, he began to raise his putter. Then, at the last moment, the ball hit a slight bump in the green and bent away from the hole, just nicking the edge. A cruel lip-out had erased Mickelson's chance at history. He clasped a hand over his open mouth. At the edge of the green, his caddie Jim Mackay, who was clutching the flagstick with both hands, toppled backward onto his rear in disbelief. Thousands of fans in the grandstands groaned. “I saw that ball rolling right in the center,” Mickelson said. “I went to go get it, I had that surge of adrenaline that I had just shot 62, and then I had the heartbreak that I didn't and watched that ball lip out. It was -- wow, that stings.” “He hit the best putt he could,” said Els while standing in the players' parking lot as the sun slowly set. “I just feel for him. It’s incredible it didn’t go in. “I was so sure he was going to make that putt.” SCORES: View the British Open Leaderboard Mickelson, a fan favorite both at home and abroad, put on a shotmaking and putting display not seen from him at the Open since the final round of this event in 2013, when he rallied with a 66 to earn his first and only Claret Jug at Muirfield, about 80 miles down the highway. The scenes around Troon on Thursday may not have been as significant as a final round, but they were every bit as thrilling. There was Phil stuffing a wedge shot at the Postage Stamp 8th hole. There was Phil canning a long putt at 14 for the solo lead. There was Phil blasting out of the steep-faced bunker on 16 and drilling the six-footer to extend his lead. There was Phil ramming in another putt on 17 as the crowd swelled. There was Phil slapping hands with fans on his walk to the 18th tee. There was Phil flashing a thumbs-up at every opportunity. And there was Phil facing a historic 18-footer on the final green, missing and tapping in for par. "I want to shed a tear right now," Mickelson said afterward. Three back of Mickelson is Patrick Reed, who shot a five-under 66 in the morning and sat on the lead most of the day, until Mickelson surged ahead in his closing holes. Two-time major champion Martin Kaymer matched Reed’s 66. Seven players are log-jammed at four under, including defending champion Zach Johnson, British Open rookie Justin Thomas and 49-year-old Steve Stricker. The Big Four were mostly a Big Snore. Rory McIlroy came out firing with four birdies on the easier outward nine, but came home in 37 to post a two-under 69. White-hot Dustin Johnson cooled off with a 71, a score matched by Jordan Spieth. And World No. 1 Jason Day struggled to a 73. Who would have guessed that the local favorite -- 53-year-old Colin Montgomorie -- would have beat the world's best player by two? "I'm just glad I got that 71 in there, because I'll need them all tomorrow," Monty said, alluding to the foul weather that is expected to give the players fits in the second round. The first round, though, belonged to Mickelson, whose game many once believed was not suited for success on the bouncy, wind-whipped links of the British Isles. Mickelson dispelled that myth in 2013 with wins at both the Scottish and British Opens. And he did so again with his birdie blitz Thursday. “It's such a rare opportunity to do something historic like that,” Mickelson said of the final putt. “If I had just hit a weak flail-off and never had a chance and left it short, so be it. But this ball was hunting right in the center and didn't go. 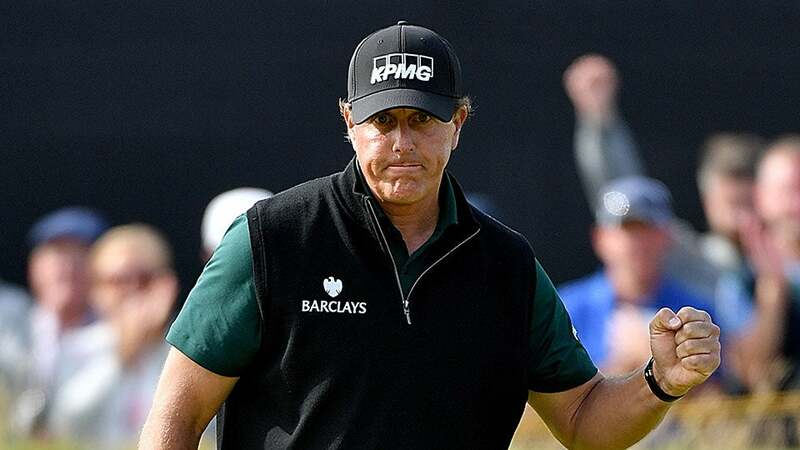 It was just heartbreaking.” But this is the kind of heartbreak Mickelson can handle. The 46-year-old is in the clubhouse with a three-shot lead in the Open Championship and in hot pursuit of his sixth major and second Claret Jug. What will Phil do next?